Windows 10 2020 Update Is Available For Insiders Who Skip Ahead. Microsoft is stretching the lead time for future updates to its flagship Windows operating system by quite some margin, giving Insiders the chance to test out in early 2019 one of the updates planned for a 2020 release. 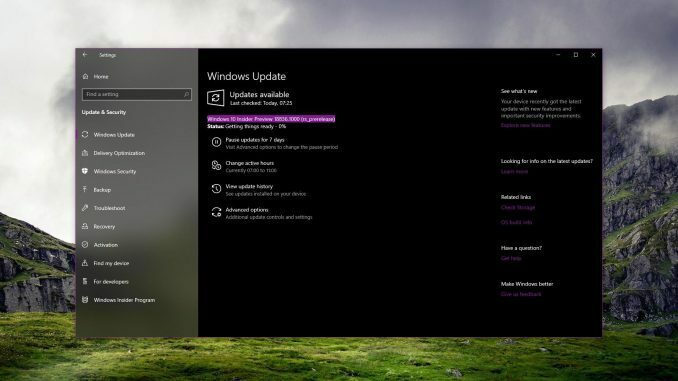 Microsoft is currently testing its April 2019 update for Windows 10, and hasn’t yet opened up its late-2019 update to testers. Despite that, the 2020 build, known as 20H1, is now available to some Insiders. Windows Insiders on both the fast and slow rings have typically been given access to Windows updates months ahead of their eventual release to try to weed out bugs and problems with the software. That didn’t work well enough with the October 2018 update, which was plagued with bugs and delays, only eventually seeing a wider release months after its planned launch time. Perhaps because of that, or perhaps because of specific features planned for future updates, Microsoft wants to have a much greater test time for its 2020 releases. Windows 10 20H1 introduces a number of bug fixes to Windows, as well as new anti-tamper protections which prevent bad actors from adjusting Windows’ security settings. Improvements will “require a longer lead time,” which is why Microsoft is giving access to some Insiders now, rather than later this year as would be typical. To gain access to this particular build, Windows Insiders will need to opt to “Skip Ahead” of existing test builds. If you opt to download and run the 20H1 Windows 10 build, you won’t be able to downgrade to the existing stable build of Windows or roll back to the 19H1 build. You’d need to perform a clean Windows install to roll back to those versions if desired. For other testers and those who would prefer to wait for Windows updates to be more thoroughly tested before using them — considering the problems associated with the last one, that might be a good idea — it is currently due in April. As The Verge highlights, a final build will go out to testers in March before its wider release. The 19H1 build includes a new light theme, a split between Cortana and general Windows search, and greater support for the kaomoji.